They had fresh haircuts and wore tapered soccer pants that ended in clean, new sneakers. The theme of the party, if I had to guess, was ’80s night or Miami Vice. Lots of black and white, and now the search was on for neons. “Bro, you don’t try on hats at the Goodwill,” one said to the other. The man threw the hat on the floor, feigning disgust. Both laughed. I found a hunting vest near them, a vintage one, and put it in my cart. Later, I’d try to sell it online for double the cost. Sometimes I feel guilty about my side hustle, that I buy clothes that have been donated and flip them into profits. I’ve spent enough hours in thrift stores to see other customers like me, the keen eye we have for that perfect ironic shirt. Most people give up a sports jersey when a player is traded, and it sits in thrift until it’s become a fine wine, aged stupidly, just right for a hipster football fan to pay $25 for it. More often than not, I wind up wearing the stuff myself. But I also watch the other shoppers: older folks wheeling around oxygen tanks, migrant workers, and lots of children. Most of them just want to look normal or had a funeral to go to. A woman and young boy were ahead of me in line this day in Central Pennsylvania with a bounty of merchandise: books and board games and puzzles and toys on the counter, along with a cart full of shoes and clothes and a lamp. Those puzzles have to be missing pieces, I thought to myself. “Now, before we play with this stuff, we have to put your bed together,” the woman told the boy. He looked to be about 6 or 7, and he clung to and spun around her leg. His hair was blond as straw. She was busy watching the men at the register sort through the books. They’d grown a little confused. "Please don't charge me twice," she said. "That's all I need." She told the boy he’d have to get a toybox, but she couldn’t buy it now. I smiled to myself, thinking this kid will never laugh at anyone at a thrift store. He won’t balk at having to buy a suit there. The boy held on to her leg and looked down, then looked back up at her. He wore glasses. She was looking past the clerks, through the window, beyond the Walmart across the street. “Well, this stuff is going to be for Mommy’s house, OK? You’re going to have so much stuff. You’re a lucky boy,” she said. A lump grew in my throat and I looked down into my cart at the clothes I'd picked out. I saw what they saw. Once, a few years ago, I took a trip to Ikea with my mom and my kids and we sat on couches and pretended to sleep on mattresses. We, too, pretended our shopping trip somehow meant we were lucky. I watched my daughter stretched out on a mattress with her eyes closed, and I had to duck behind an entertainment center to collect myself. Then we left with a truck full of boxes and awaited delivery of the larger items, headed to an empty place I’ve tried to make a home. The same thing has happened to me at arboretums and ski lodges and Disney World, a small sense that something profound was missing and couldn’t be replaced. I’ve had to catch myself often: Don’t burst into tears in public. Make them think how lucky they are. 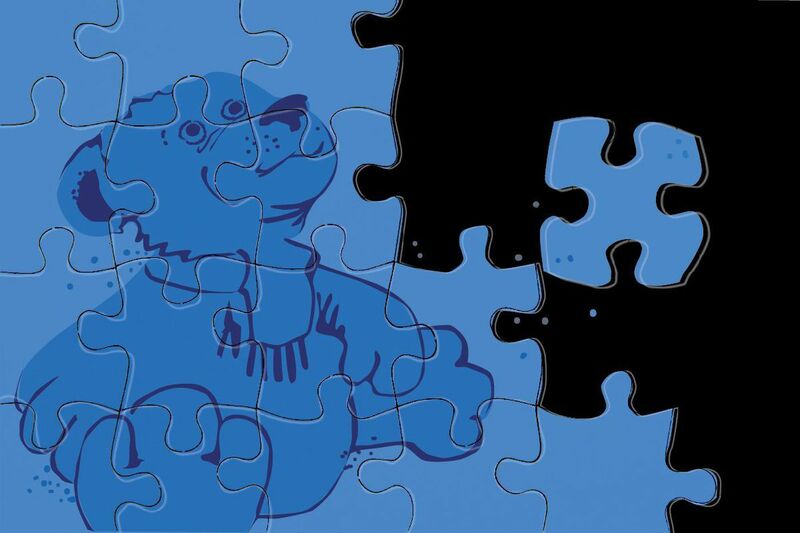 The missing piece is not a person, per se. At least not for me. It’s more of a thing, a concept, a void that can’t be filled, whether it’s in Orlando or a Goodwill store in Central Pennsylvania. It gets better, from a wound to a scab and to a scar, but in this thrift shop, I’m reminded that a phantom pain remains. When I lifted my eyes, I saw the woman thumbing a credit card in her hand. The clerks still hadn’t figured out the book tally. Her boy was still looking down and spinning around her leg. Then he stopped and looked up at her and spoke again. “No, Mommy. Mommy? Maybe I mean that can we all go back to Daddy’s. Not just the toys,” he said. She smiled then looked off again. Before she left, I contemplated trying to pay for some of her bill or doing, I don’t know, something. I just said, “Good luck” and I don’t think she heard me, but I hope in whatever new, empty apartment they were heading to, the two of them could make a complete picture out of this new puzzle, even if it’s missing a few pieces.